Tesla's second-quarter results may continue to show that there's healthy demand for the Model S around the world, but the company's upcoming plans for its Gigafactory are more important. Updated from July 30 to reflect agreement between Panasonic and Tesla on Gigafactory in fifth paragraph. NEW YORK (TheStreet) –– Tesla Motors (TSLA - Get Report) second-quarter results may show that there's continued healthy demand around the world for the Model S, but the electric carmaker's upcoming plans for its Gigafactory are where investors should be focused. Morgan Stanley analyst Adam Jonas, who rates Tesla overweight with a $320 price target, notes that while deliveries will likely come in higher than expected (he's expecting 7,725 units), the larger focus will revolve around the Gigafactory, where the company will house all parts for its vehicles. "All eyes will be on gigafactory site/state selection and partner designation," Jonas wrote in a research note. "Any delays from here could threaten timing of Gen 3 launch." Tesla recently confirmed that the third-generation model, which is due around 2017, would be named the Model 3, following comments CEO Elon Musk made about the company calling it the Model E, and Ford F subsequently filing a lawsuit, saying it owned the trademark to the Model E name. In February, Tesla unveiled plans for a Gigafactory, noting it expects to reach production unit rates of 500,000 cars per year by 2020 as a result of the new manufacturing center in addition to helping cut battery costs by more than 30% by 2017, when the mass market Model 3 is scheduled for public sales. Tesla recently said that not only are Arizona, Nevada, New Mexico and Texas finalists for the plant, but California has also been added to the list. On July 31, Panasonic and Tesla announced an agreement making Panasonic an official partner in the Gigafactory, with Tesla managing the building and the land, and Panasonic manufacturing and supplying the lithium-ion cells, as well as investing in the plant. Tesla will take the cells and other components to assemble battery modules and packs. To meet the projected demand for cells, Tesla will continue to purchase battery cells produced in Panasonic's factories in Japan. UBS analyst Colin Langan said shares "will trade on the conference call commentary around expected deliveries, demand in China & Europe, and the Gigafactory timing (ground breaking expected in June)." Langan rates shares "neutral" with a $200 price target. Shares have not reacted to any hint at a delay for the factory, having gained nearly 50% year to date, as investors applaud Tesla's plans for the future, and more importantly, Musk's candor. This comes following a 352% move in 2013, as Tesla outpaced a 41.1% gain in the NASDAQ, and a 31.8% return in the S&P 500, not including dividends. For the second quarter, Tesla said it expects to deliver about 7,500 Model S units as the company looks to surpass 35,000 Model S deliveries for the year. The company noted it looks to produce between 8,500 and 9,000 cars for the quarter, up 13% to 19% sequentially. JPMorgan analyst Ryan Brinkman, who rates Tesla "neutral" with a $163 12-month price target, emphasized that Tesla will be able to deliver 7,800 units this quarter, slightly better than what the company expects. "We maintain our 2Q forecast for deliveries of 7,800 units, slightly above the company guidance of "about 7,500" deliveries issued at the time of 1Q earnings," Brinkman wrote in a research note. He concludes that Tesla actually produced 8,800 units in the quarter, but 1,000 are in transit to Europe and China. "2Q14 will probably be OK for Tesla, given the cushion once again built into the company 's volume forecast (TSLA is forecasting 7,500 deliveries on 8,500 to 9,000 units of production, with the delta being attributable to "vehicles in transit internationally") - we are modeling 8,500 units," said Bank of America Merrill Lynch analyst John Lovallo in a research note. 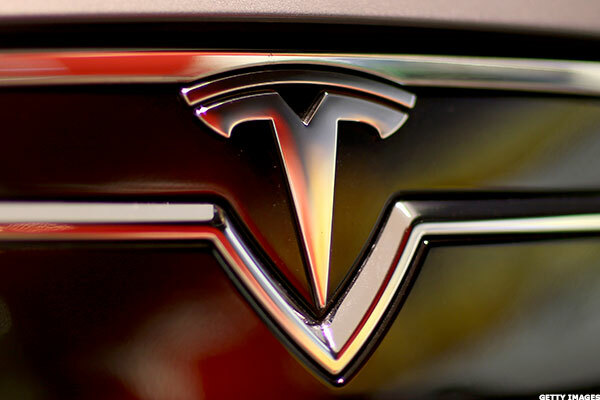 Lovallo rates Tesla "underperform" with a $75 price target. Analysts surveyed by Thomson Reuters are expecting the company to earn 4 cents a share on $810.57 million in revenue for the second quarter. For the first-quarter, Tesla earned 12 cents a share on $713 million in revenue, as it delivered 6,457 Model S units for the quarter. 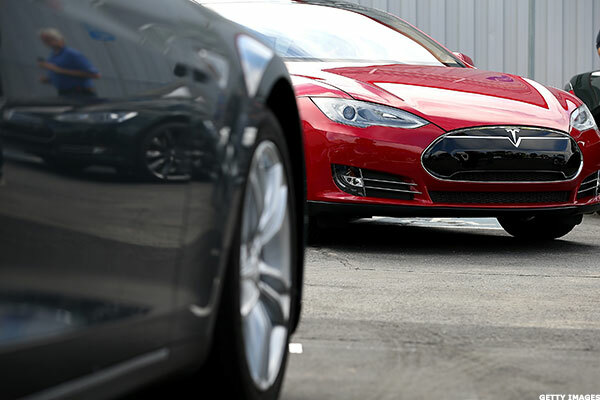 Tesla produced 7,535 Model S units during the quarter, but was only able to deliver 6,457 due to the number of cars in transit to both Europe and Asia. The company said non-GAAP gross margins were 25% for the quarter, slightly ahead the 25% it reported in the fourth quarter. Tesla generated $61 million in cash flow from operations during the quarter. The company ended the quarter with $2.6 billion in cash and marketable securities due in large part to the $1.8 billion convertible bond offering executed in February. Tesla noted that research and development expenses were $68 million on a non-GAAP basis and $82 million on a GAAP basis, due in part to Model X engineering work acceleration, and "efforts continued to adapt Model S for growing international markets." Aside from commentary about the Gigafactory, perhaps the most important point is whether North American demand remains high, or whether Tesla is near peak demand, noted Lovallo. "It will likely become increasingly evident that NA volume has peaked, which should provide a reasonable benchmark for penetration in Europe and ultimately China, and introduce some doubt to the bull thesis of volume growing into perpetuity." 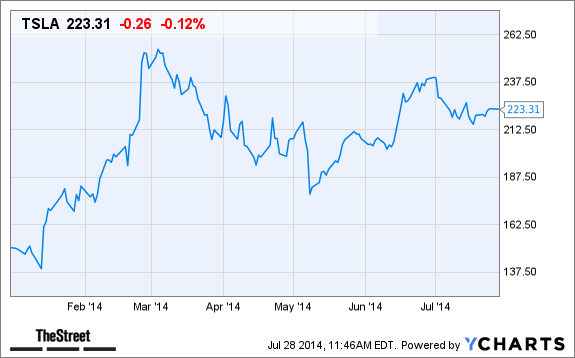 The figure is above the price range Pinterest set earlier in an updated S-1 filing. Zoom is one of two unicorn IPOs scheduled for Thursday.